A nearly perfect family sports sedan! 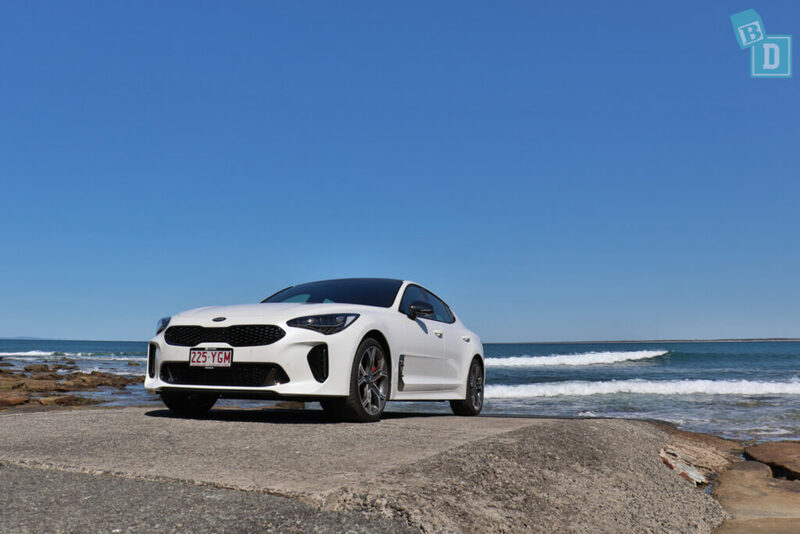 I reviewed the Kia Stinger V6 330Si a few months ago and now I have had the chance to review the GT version, this time with a video! 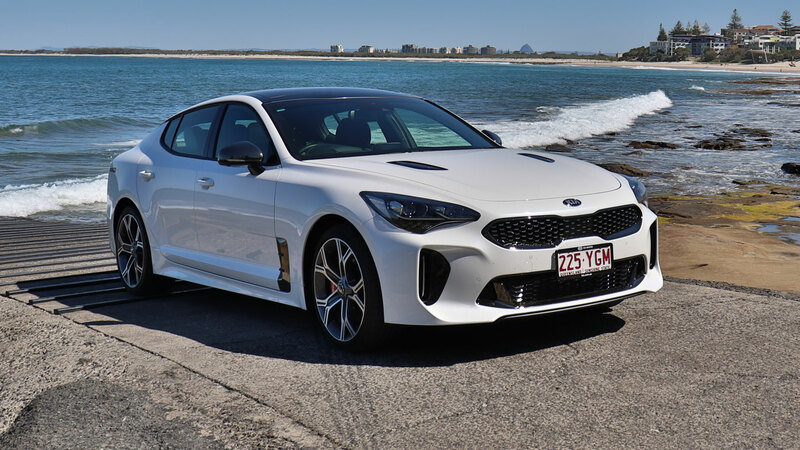 Kia describes the Stinger as ‘The family sports sedan with five doors’. 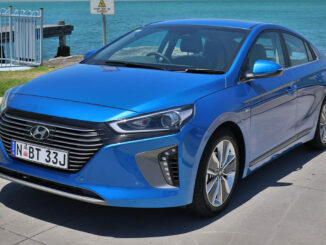 It is a VERY sporty and good-looking vehicle that I LOVED driving on my own previously so I am looking forward to putting the GT version through BabyDrive testing! The Stinger gets a big tick for boot space! 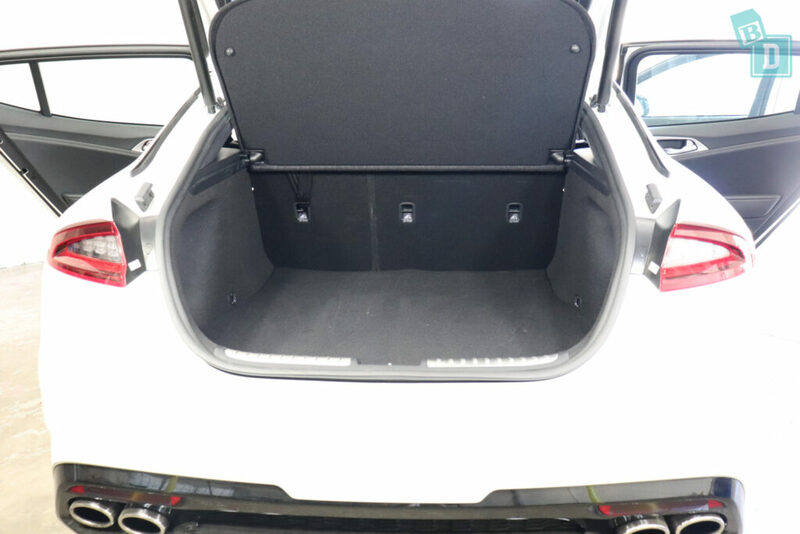 For a sporty car, I really was not expecting to open the boot and find this much storage space! It’s AMAZING!! 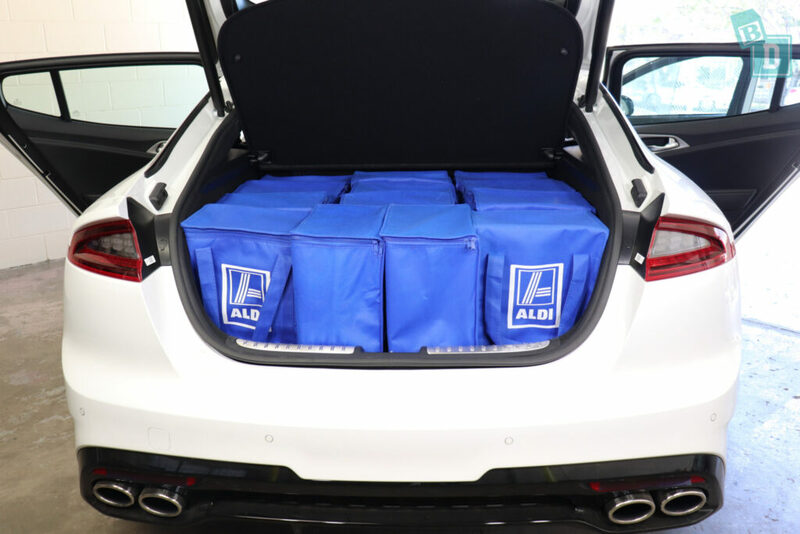 With nothing else, I could fit 13 shopping bags in the boot! One thing I did discover this time because I was testing using different strollers to previously, was that the boot is shallow. Strollers like the Britax Flexx tandem only fitted with one shopping bag because there wasn't the depth in the boot for it to stack on top of itself, so all the components had to go side by side filling the boot space. The Mountain Buggy Duet twin stroller fitted with four shopping bags, the Mountain Buggy Urban Jungle with five and the Nano compact stroller with 9. That’s wagon and SUV territory!! We found there was plenty of room in the boot for our family weekend away with three adults and our toddler. 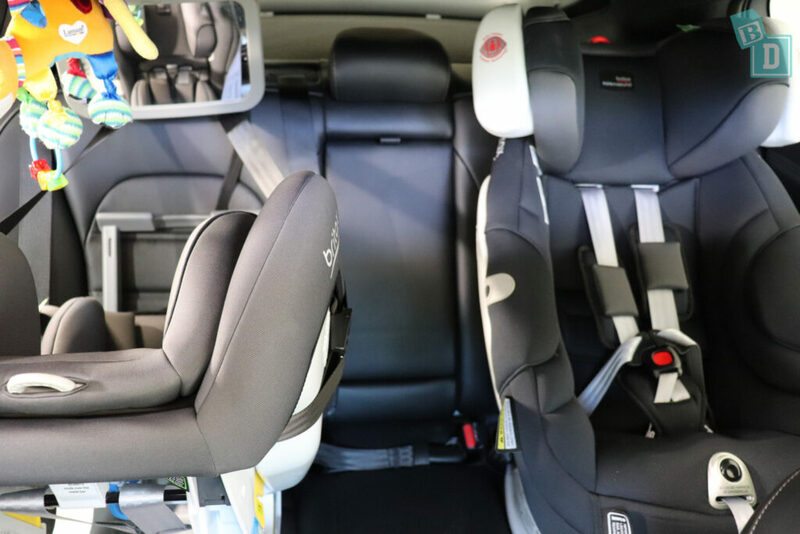 When installing child seats in the back, it was really easy to connect the ISOFix into the two outer rear seats. The Stinger has the best ISOFix guides I have come across in a vehicle so far!! Plastic guides that have a cover you press for opening and the motion helps you insert your ISOFix connector. 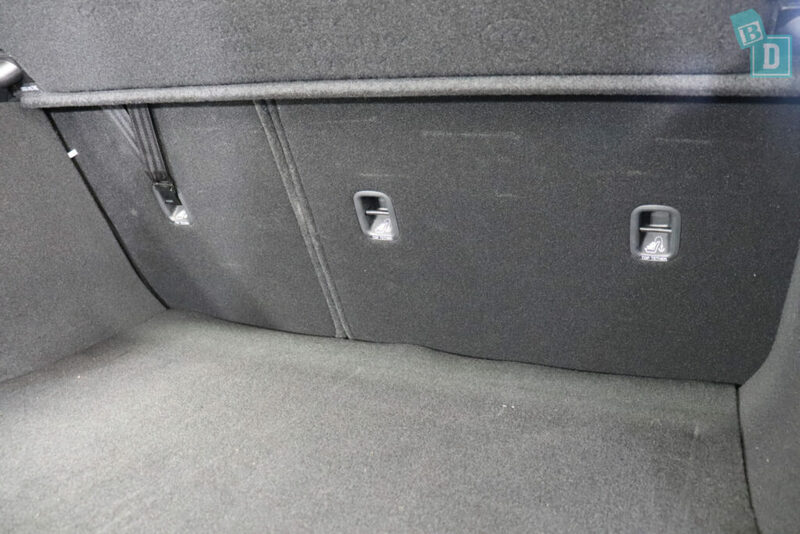 There are three top tether anchor points situated in the seatbacks in the boot. We found only two child seats fitted in the back, in the outer seats, with not enough room for a third in the centre or even for a passenger to sit between the two child seats. The media touch screen system in both models is very good, it’s so easy to use and the swipe and scroll method is easy to navigate the first time you use it. The Stinger has Apple CarPlay, which just makes life so simple! The Bluetooth is simple to connect to; instructional prompts actually come up on the media screen to help you connect your phone to the vehicle. The air-conditioning in the Stinger is very effective and easy to control, taking no time to cool the cabin on a hot Queensland day. There are five vents in the front and two in the back for rear passengers, I could reach the rear controls from the front to control them for little passengers. The rear passengers are well catered for with a 12V socket and USB charging point in the back also. The glove box and central console box are both lined, which helps minimise rattling sounds. 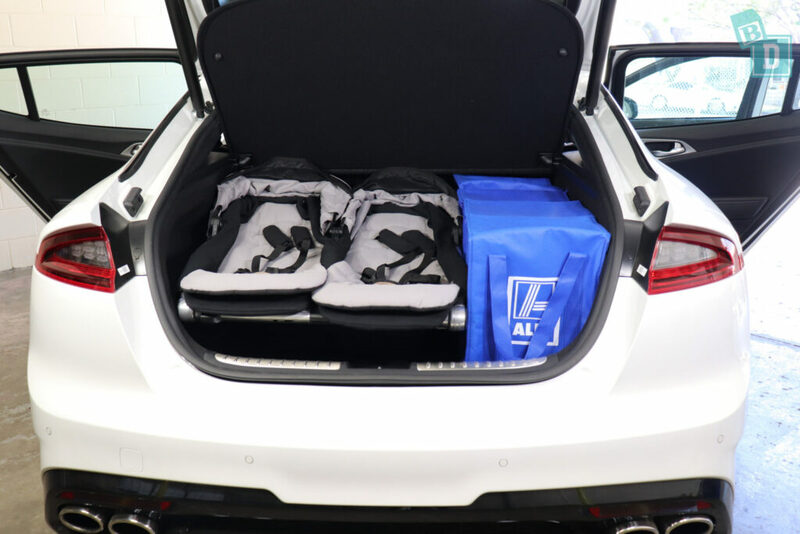 As a family car and a BabyDrive, these are my main pros and boot space and ease of installing child seats are very important major factors. BUT…. there are a few other big-ticket things that are important as a BabyDrive and unfortunately, the Stinger fell short! Like being able to put your child in and out of their child seat and fastening their seatbelts! The roof is so low at the back that it was really uncomfortable getting down and in to do up seatbelts and restraints. It became a big bugbear as the week went on. Also, the physical space you have to post the child through into their child seat is tiny because the door opening is so small and the ceiling is so low! 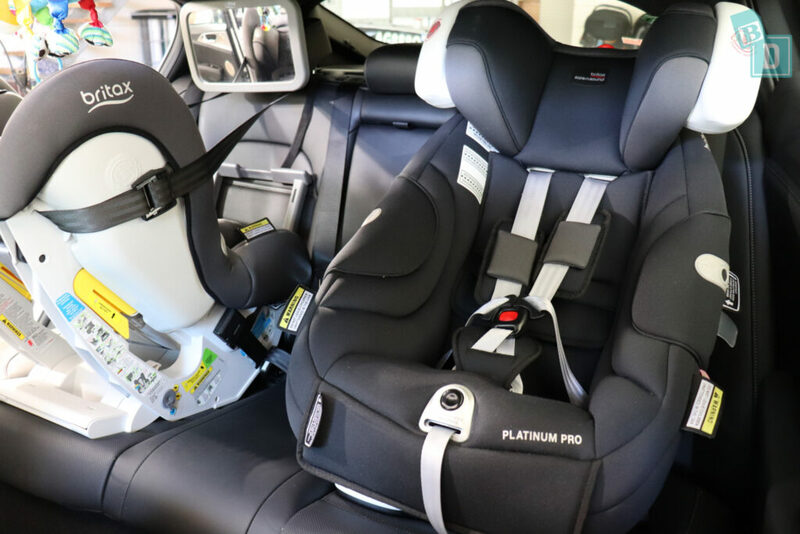 I found the problem just as bad with forward-facing and rear-facing child seats and I hit my daughter's head many times over the week we had the Stinger GT. On the same note, the low-slung roofline impacts inside the vehicle too. In the back, it makes putting bub in and out of their seat from inside the vehicle very difficult. 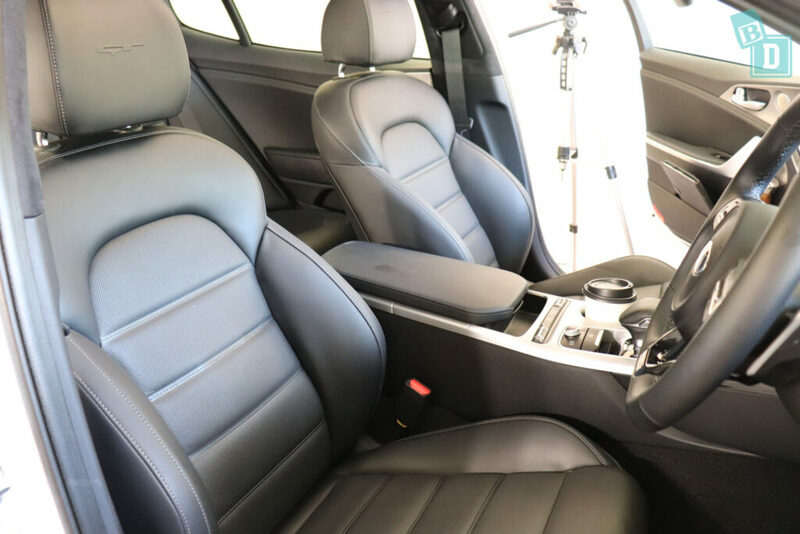 For the driver and passengers, it feels a little dark and claustrophobic and headroom in the back is just enough for a tall passenger but the legroom is not great especially as the front seats sit so low down that they trap rear passenger's toes underneath them … literally! The windows are shallow too, making visibility extremely poor. As the driver, I really couldn’t see much behind me past my headrest. 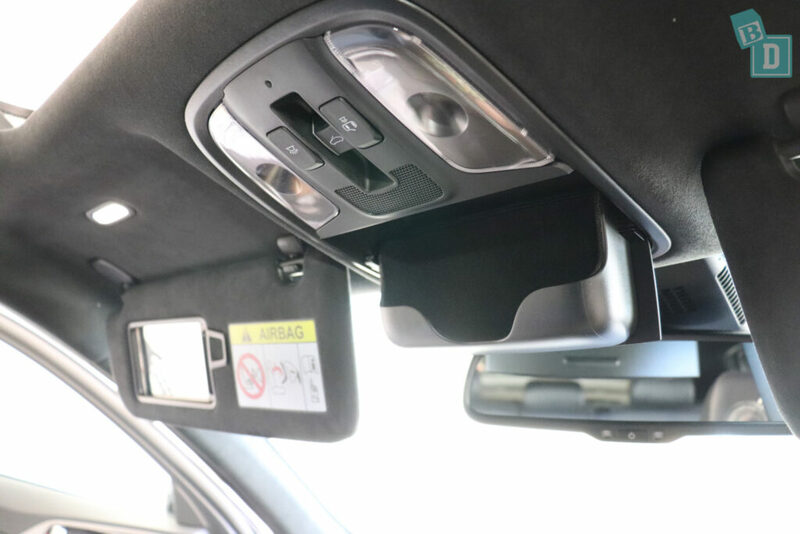 Thankfully the reversing camera is very clear and can be used without selecting reverse using a button on the central console, and you can turn it on or off. 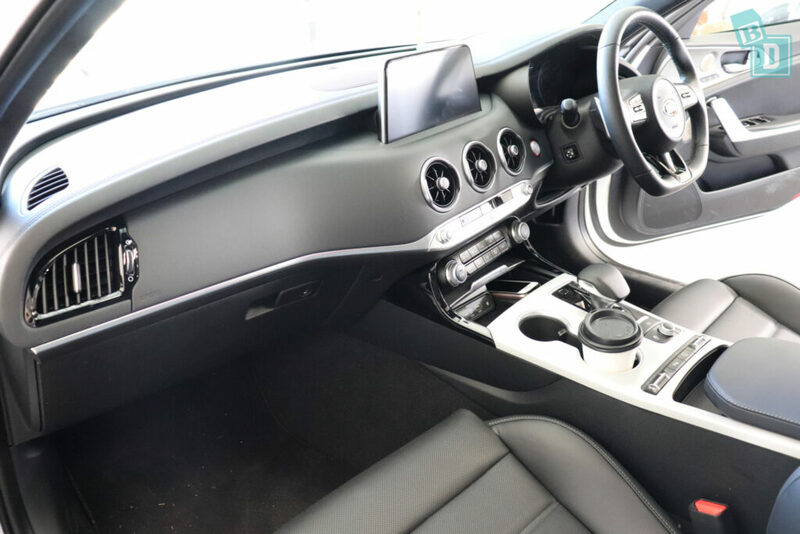 The central console and dashboard wrap right around the driver and front passenger; it is beautifully designed and has a feeling of a business class seat on an aeroplane. However, with the low ceiling and narrow windows, I felt hemmed in. The Stinger is also one of the most vocal vehicles I have driven!! It has welcome chimes, goodbye tunes and alert noises for almost anything you can think of!! The seats in the GT model had perforated leather throughout, which would be very difficult to keep clean and crumb free! It is difficult then, to sum up if the Stinger is a good BabyDrive and family sports sedan. It definitely has space in the boot and legroom is good. A 184cm passenger can sit in front of a rear facing child seat. If you are a family of four it is fine and if your rear passengers are in forward-facing child seats that would help too if they can climb in and out themselves. It is a good looking car and great to drive! The Kia Stiger Si, Ex, GT line, GT Sport and GT variants all got a 5-star ANCAP safety rating in 2017. Whereas the 200S and 330S variants only scored a 3-star ANCAP safety rating in 2017. So choose carefully if you buy second-hand! 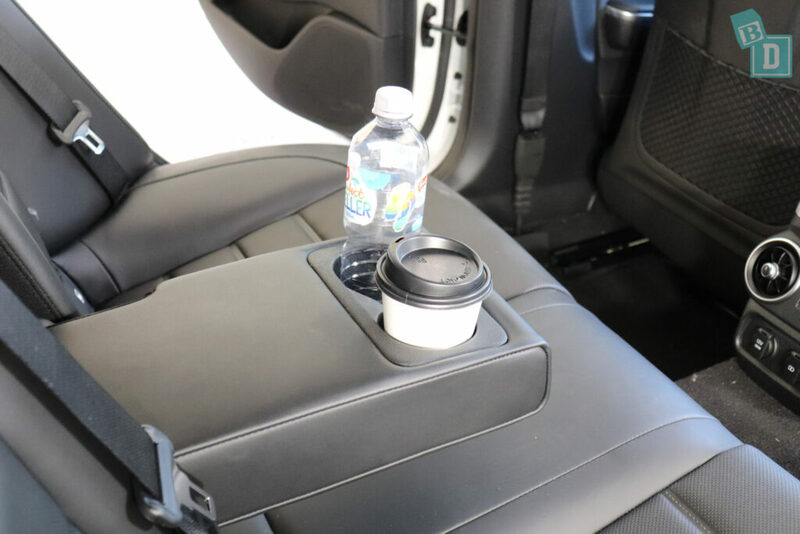 In the front of the Stinger are two cup-holders in the central console that will hold a 600ml water bottle, a disposable coffee cup or my reusable Cheeki travel mug and the larger one at the rear will hold my large refillable water bottle. A Pigeon baby bottle fits well in the front coffee cup holder. The door pockets in the front would hold my large refillable water bottle and I could fit either my wallet or iPad in too, although the iPad was sticking out at an angle a little. 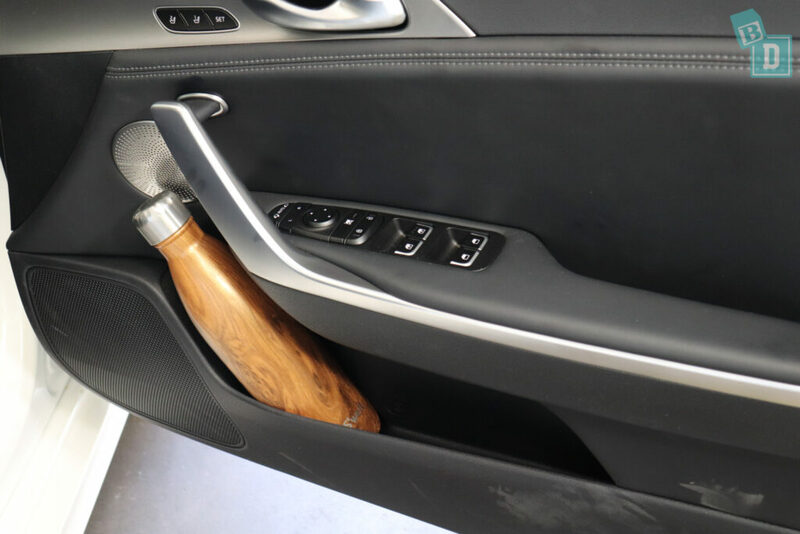 The doors have silver handles as well as large wells in them, these are great for storing small items from children’s hands when you’re trying to get them in and out of their child seats, or for the keys whilst doing up their harnesses. The central console has a large storage box which is felt lined on its floor and walls. This is a great area for your wallet and keys as the felt stops keys making rattling noise whilst driving. There is also a small tray in there, which is removable. I found this a good place for an old iPhone that I keep loaded with the ABC Kids app for emergencies on long journeys! There are no sockets inside the central console box to charge phones from. This box has a padded lid that acts as an armrest for the front passengers, and just in front of this is small rubber lined well which is a great shape to hold a pair of glasses for example. There is another covered storage area with a lid that slides across when you press it. 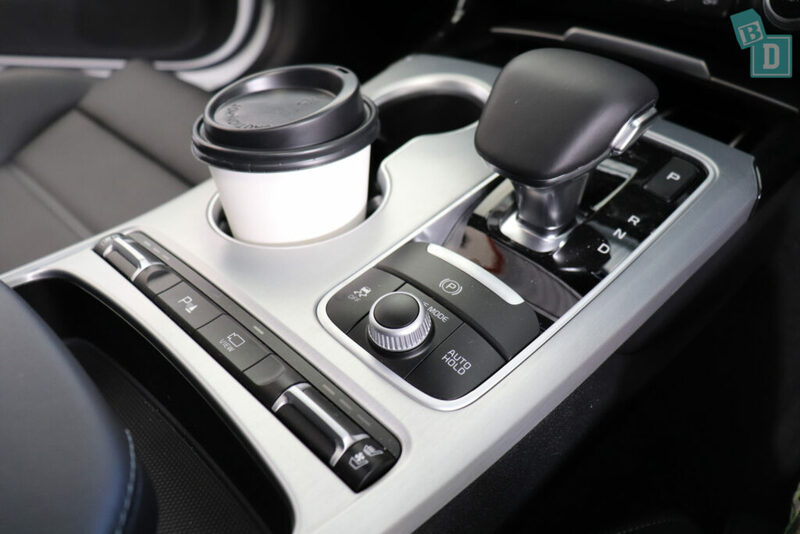 It is also rubber lined and positioned in front of the gear lever and cup holders. 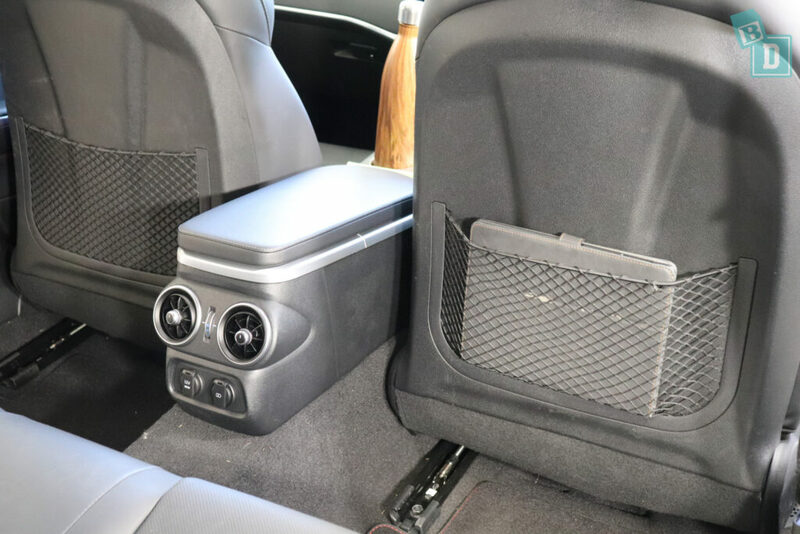 In here are USB, a 12V socket, AUX and a wireless charging mat. 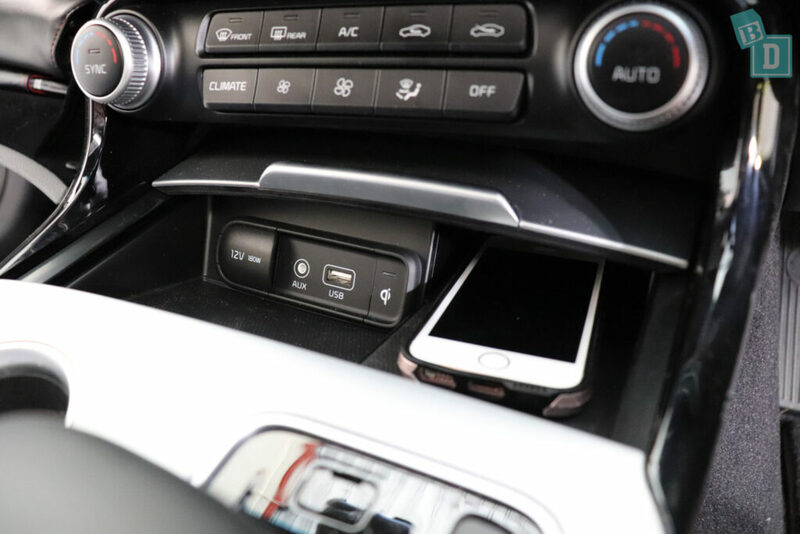 This area is large enough for my phone so I have found it the best place for charging my phone whilst travelling, but it is rather annoying having a long USB lead hanging down in the footwell. There is a single glasses case in the ceiling positioned with beside the interior lights. 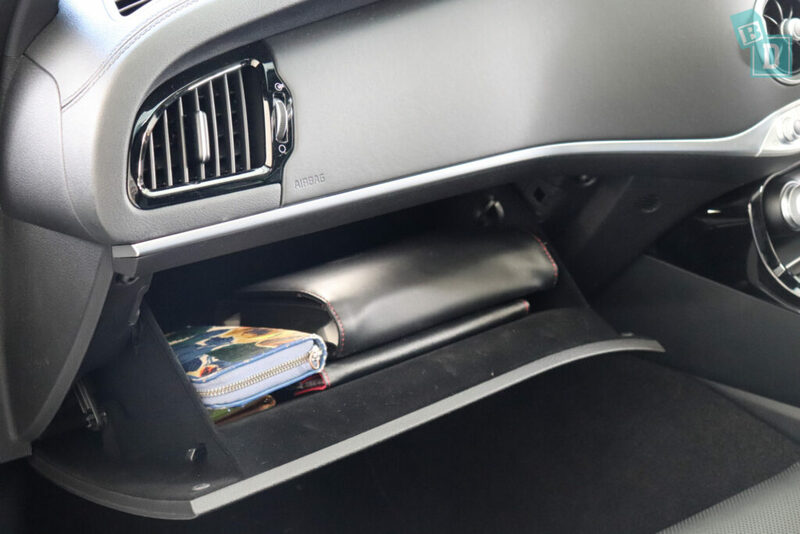 The glove box is not enormous; the very large manual that comes with the Stinger mainly takes it up and I only managed to get my wallet in with it this time. There is no hidden under seat storage in the stinger the seats are very low so there would be no space for this. In the back there are map pockets on the back of both seats, however, they are made of net and very small so anything you put in there would be visible. The back door pockets are smaller than those in the front; they will hold a 600ml water bottle or Pigeon baby bottle however they were not big enough for a wallet or iPad. In the central rear seat back is a fold-down armrest with two cup holders in it. 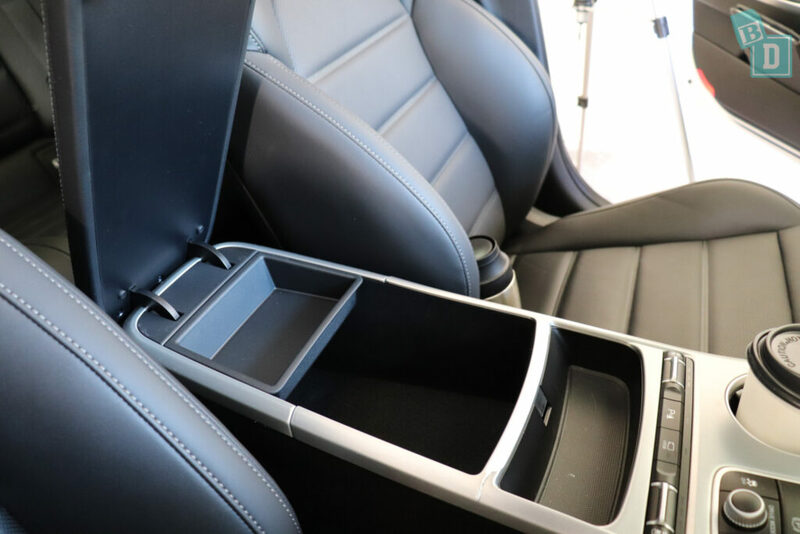 They are not ideally positioned for rear-facing passengers, as they cannot reach the cup holders to pick up their drinks. The cup holders were not ideally sized either as they were too large for many of the vessels we were trying, even a disposable coffee cup, Pigeon baby bottle or Cheeki travel mug all moved around in them. A handled Sippy cup would not fit because of the handles and my large refillable water bottle would not fit it was too big. So it is a case of them being there but not very practical to use! The boot space in the Stinger is really large, topping some of the mid-sized SUVs and wagons I have tested recently. Empty I can fit 13 shopping bags in the boot. With the Mountain Buggy Duet twin stroller, I can fit four shopping bags alongside it. The Britax Flexx tandem stroller fitted with only one shopping bag. I realised this time reviewing the GT version that the boot is very shallow and not deep enough to stack the components of a modular stroller, like the Flexx, on top of each other. So they have to go side by side and this filled the boot space, leaving only room for one shopping bag! Our Mountain Buggy Urban Jungle stroller fitted in both lengthways or widthways in the boot space, which is really handy when you’re playing Tetris on a family outing!! In either direction, I could fit five shopping bags in around it. The Mountain Buggy Nano compact stroller fitted with nine shopping bags. 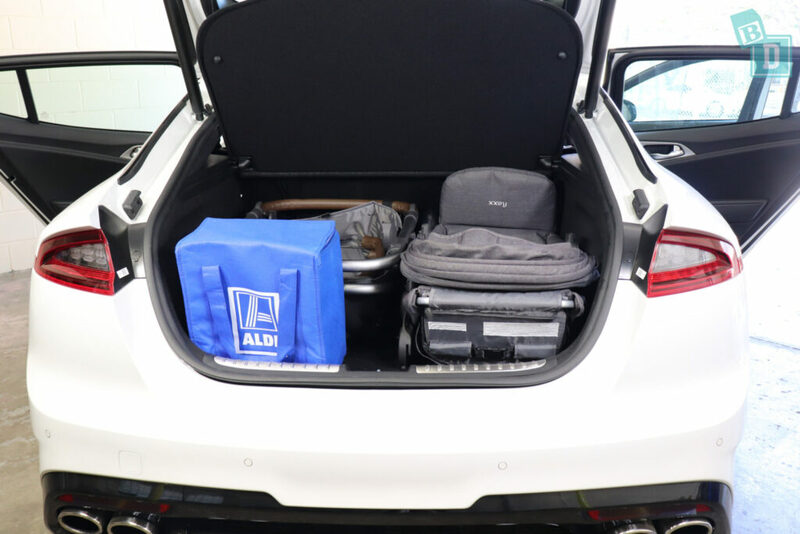 Loading things in an out of the boot is relatively easy the space is very large and with the boot lid open very easy to access. 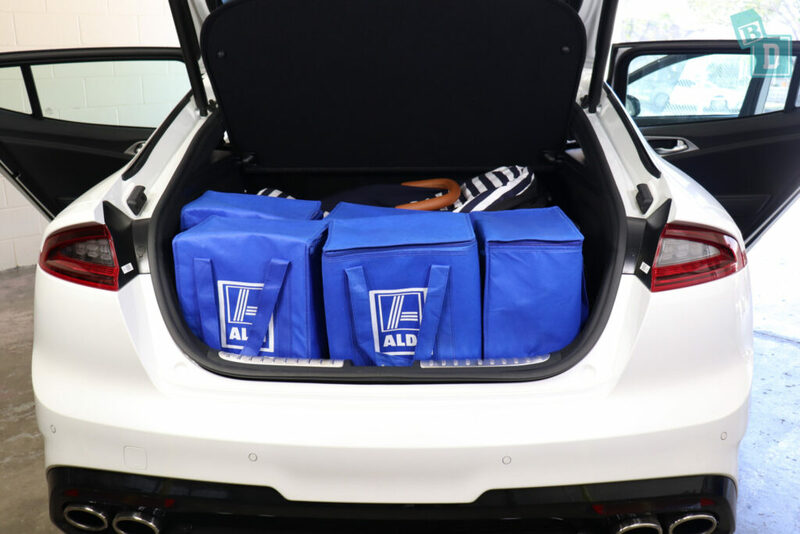 It is deep, however, so quite a way to reach to the back and it’s low so you are bending down and across quite far to get things into the back of the boot. Baby can easily lay down for a nappy change in the Stinger. You have to bend down to do it but the floor is carpeted and soft, a nice surface for baby to lie on and it’s a large, even area. There are no sockets in the boot of this car just a manual fuel door release handle. 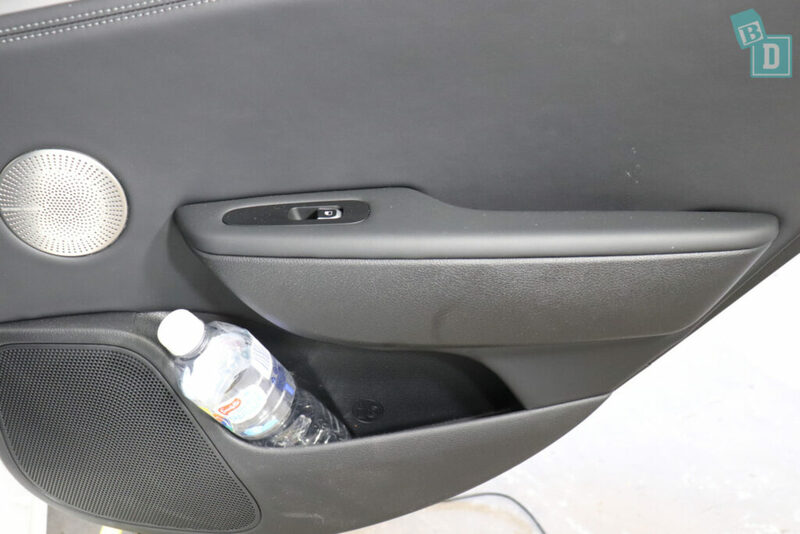 The boot expands behind the wheel arches like wide hips and although there is no sunken floor well, I have found these little spaces good storage areas for lunchboxes and water bottles and things I just don’t want to move around in the boot while driving. Just getting in and out of the Stinger there is beeping and chiming! The Stinger seems to chime till you wear your seatbelt or a certain number of times when you first get in the vehicle. I found it is quite a vocal car and I have been constantly saying what’s that noise for, what’s that noise for the whole time we’ve had it! The parking sensor volume cannot be turned down or muted in the media screen. You can turn it off using a button on the central console but you have to remember to do it each time you select reverse as it does not turn it off for your entire journey, just while you are in reverse. I can understand that this has been done as a safety feature so that the parking sensors will come on with each manoeuver you do. However, from a BabyDrive perspective, I want to be able to select to turn the sensors off for the entire journey if I have my child asleep in the car. Another issue with the sensors for me is that the visual is in the digital display in front of the steering wheel and not on the media screen. I find this very difficult as while you are turning the steering wheel, its spokes and your hands get in the way of the display that is alerting you where an obstacle is. When reversing you have to stop, peer around the wheel or your hands and it can be really off-putting. 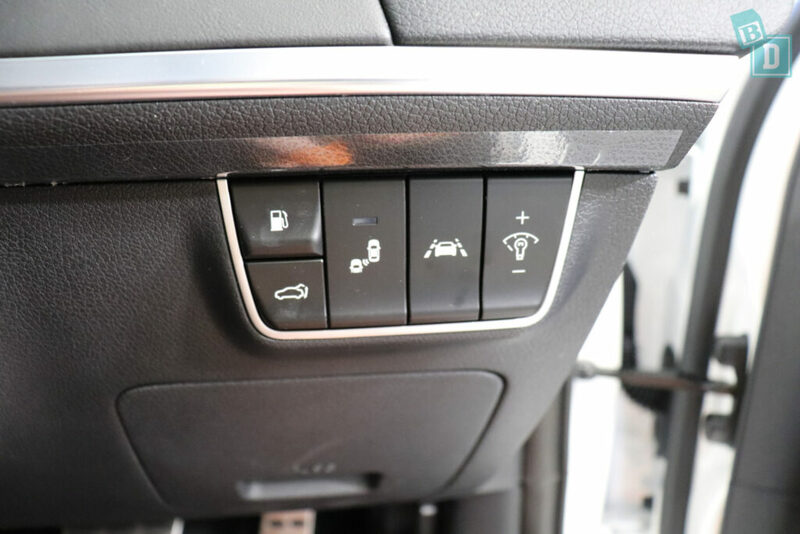 The button for turning the sensors off is located beside the rear camera button which allows you to view the rear camera at any time. I LOVE this feature! It is so handy, I can look behind me especially when in a parking area or when I drive onto my drive so I can position myself within a space and check that I’m in the position I want to be in, or that there’s no one behind me without having to put it in reverse. I found the guides in the Stinger's reversing camera some of the most reactive and useful of all the cars I've driven. 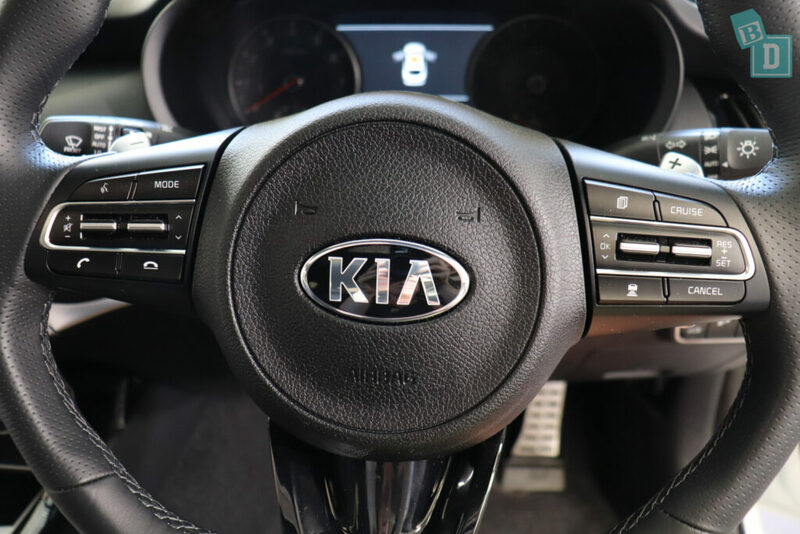 There is a button by your right knee that allows you to turn on and off the lane departure warning and blind spot monitoring in the Stinger. You cannot change the volume for this and you need to select it for each journey if you want it turned off. The indicator volume is pretty quiet and would not affect sleeping children on board, which is just as well because the volume cannot be altered. 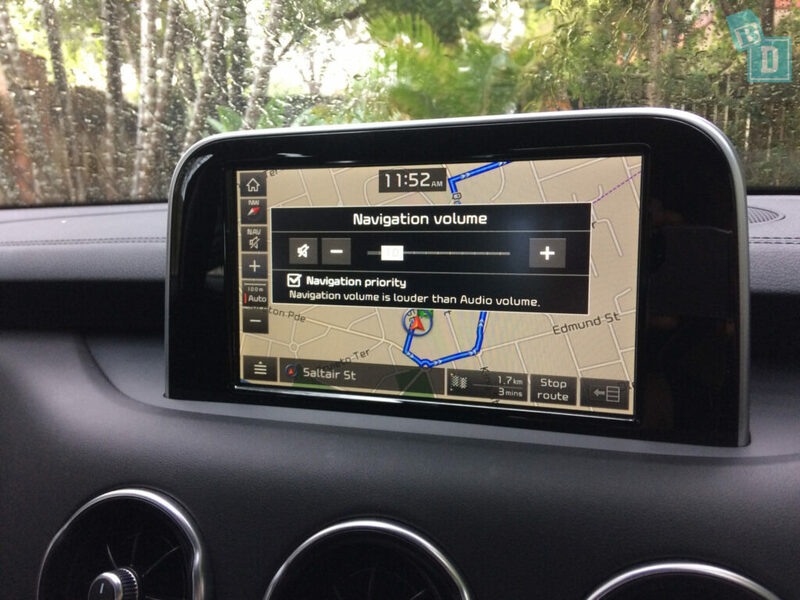 The sat nav volume controls are easily adjusted on the touchscreen and by pressing the volume button you can either mute it altogether or control the volume on a sliding scale. It was really easy to connect my phone to the Stinger; it has Apple CarPlay, which makes things easier. I had my nursery rhymes already playing on my phone and soon as I plugged in the USB the song played out of the car speakers. The doors and windows both open and close with really nice quality feeling mechanisms and are quiet enough that they would not disturb a sleeping child. The doors and windows can be locked from the driver's door control panel but they do not auto lock. The Stinger does not have auto engine cut out to save fuel when you are stopped at lights. The Stinger beeps and chimes whenever you press the park ‘P’ button, or you put it in reverse ‘R’. It is a little irritating and I don’t see why I need it? An alarm did not sound when I came to a stop, took off my seatbelt and opened the door with the engine still running. However, as soon as I turned the engine off it chimed to tell me to remember my rear occupants! This would wake any sleeping child you were hoping might remain asleep or you delicately transferred!! Overall the Stinger does make a lot of noise! It beeps and chimes and bleats at any given opportunity! With a sleeping child on-board that would really disturb them and drive me as mum demented! 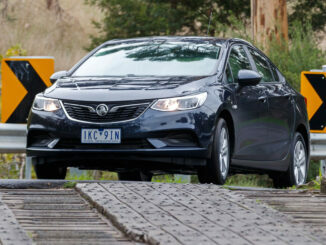 The Stinger is a large five-seater sedan. There is ISOFix in the two outer rear seats, and the ISOFix anchor points are SO easy to use they are by far the best ones I have experienced so far! 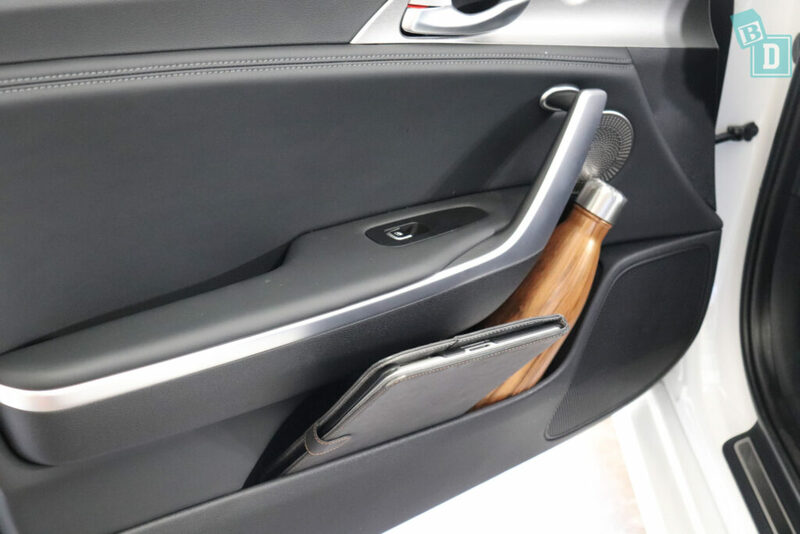 They're encased within plastic guides, making it easy to locate the ISOFix bars and you do not have to move seat fabric out of the way in order to connect them. 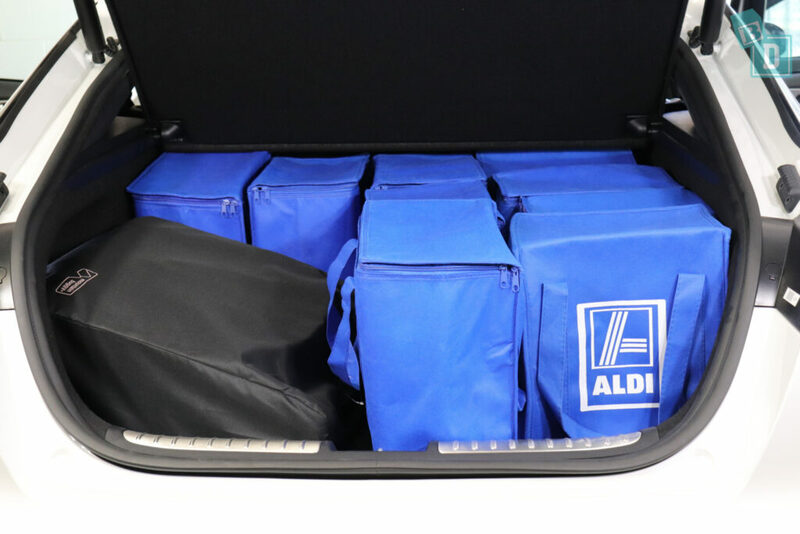 There is top tether for all three of the rear seats, situated in the back of their backrests, in the boot. I could easily install two child seats in the back, one in each outer seat. We could only fit two child seats in the back of the Stinger and although there is the third top tether point for the central seat, there was not enough room for a third seat or a person to travel in the central seat. 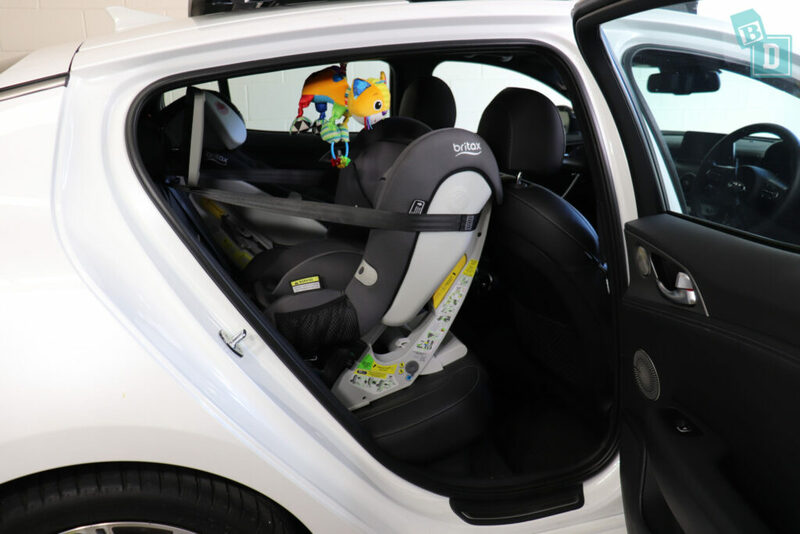 Posting baby into their child seat from inside and outside the vehicle is VERY difficult because of the low-slung roof and tiny door opening. I actually found this a MAJOR problem for the week that we had the Stinger and found it easier to insert child from inside the car rather than outside. The door opening and roofline are just too small and low when trying to squeeze in from outside. There is room to feed Bub in the back seat if you only have one child seat installed. All seats are made from perforated leather, so keeping them clean is difficult as all crumbs and sand will get trapped in the perforations. The back seats are quite angled but not as bucket-like as the front seats. However, you may need to put a wedge under a baby capsule in order to level out the base. There is a good amount of legroom in the back but the front seats are very low and rap rear passengers toes underneath them. There is plenty of space for a 184cm passenger to travel behind a 164cm driver. The legroom in the Stinger is surprisingly good. There was enough for a 184cm passenger to drive comfortably in front of a rear facing child seat. Personally, I find the back of the Stinger claustrophobic, as it is very low and dark inside and the windows are narrow. The seats sit very low and although you can raise the driver's seat I then found my head is close to the ceiling. The seats themselves are very adjustable in terms of the angle you sit at and they are comfortably padded and the support feels nice. 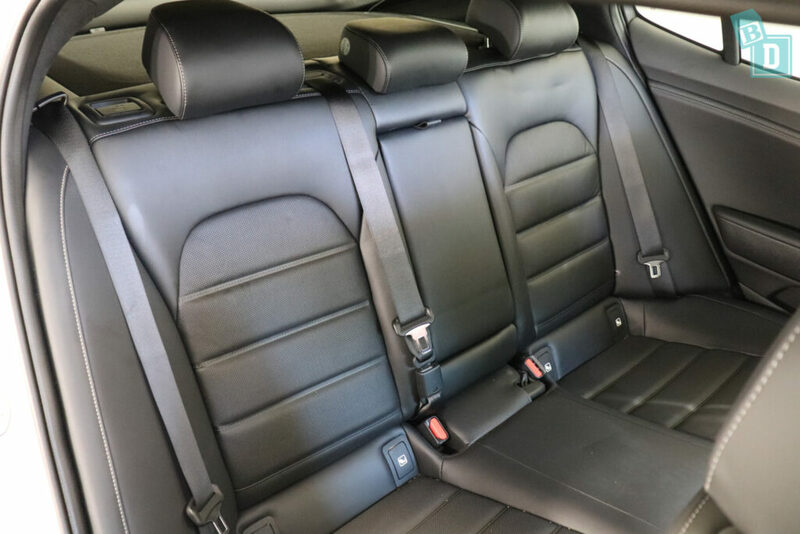 The comfort of the seats in the back of the Stinger is good in the outside seats, with the same well-padded and supportive feeling as in the front. However, the central seat is very raised and there is a tall mound in the footwell so your legs have to straddle that. With a child seat installed you are really pressed up against it if you sit in the central seat. You can not fit a passenger in the central seat if you have two child seats installed, as there is not enough room between them. For the first year of Tulsis life when we would go out as a family, if I wasn’t driving, I would travel in the back with Tulsi so it’s important to check the back seat comfort as you may be spending a lot of time in them! They were never something I gave any thought to before but I definitely notice a good or bad back seat now! In the back of the central console box, there is a 12V socket and a USB socket for charging phones. These are situated below the two air conditioning fans and controls. The second-row seats do not adjust for legroom and the backrests do not adjust for reclining their angle either. The windows in the back really shape up towards the back of the doors, making visibility very poor for rear-facing passengers especially. For forward-facing passengers, visibility is not great either because the windows are very shallow. One thing I have noticed since being a mum is I hate it when I reach a destination or get home from being out and Tulsi has either done really well in the car or she is screaming her head off and I have done really well to keep it together for the entire journey (usually the latter!!) and it takes 10 minutes to park the car! It can be really stressful. Usually I dread when we get the big cars and utes as they take longer in our tight apartment block carpark, the poor visibility of the Stinger meant it was not quick to park but the excellent camera and parking guides made it much easier! The front headrests are very adjustable; you can simply push them forward and I found you could make them very comfortable while wearing a ponytail!! I spent hours doing my hair this morning, said no new mum ever!!! The steering wheel is fully adjustable in/out and up/down. The cruise control buttons are located on the right on the steering wheel and were simple to use and quite accurate at 60km/h on undulating roads. The Aircon in the stinger is very good. In the front, there are five vents. Three circular ones in the middle of the dashboard, the kind that sometimes looks really cheap and plastic but in the Stinger they don’t. Also, one large one at either end of the dashboard shaped to finish off the ends of the dash nicely. I found the air conditioning very effective and strong enough in the hot Queensland sun. The controls are very easy to use and well located in the centre of the dashboard. 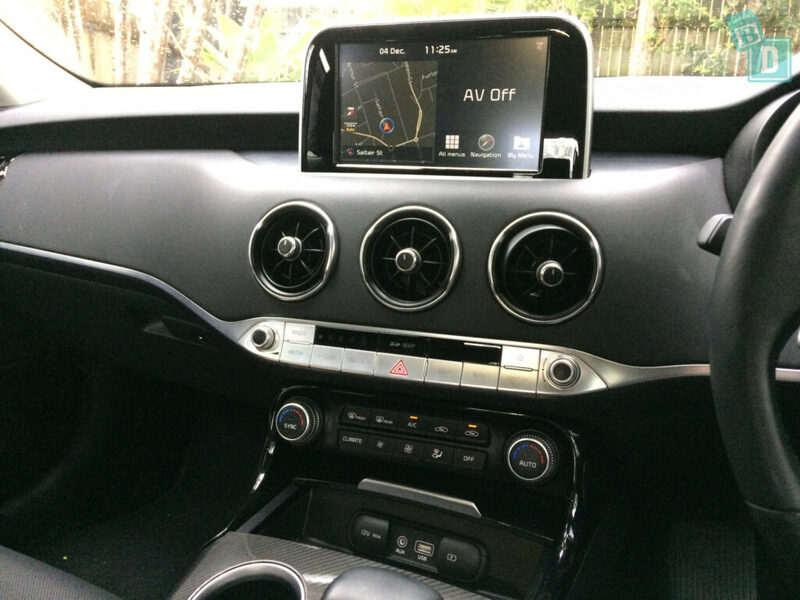 You do have dual controls so you can change the temperature on either side for the front passengers. 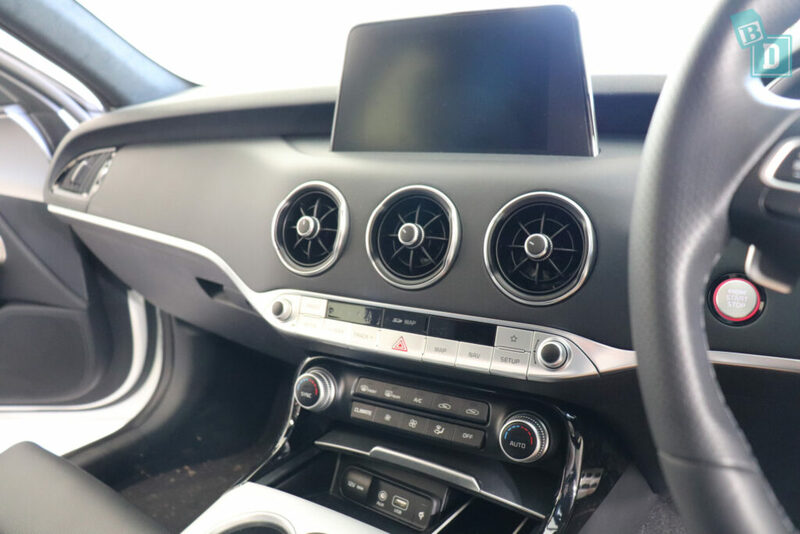 The rear vents are a well-positioned pair on the back of the central console, easy for mum to be able to change them whilst driving if you have small infants in the back. 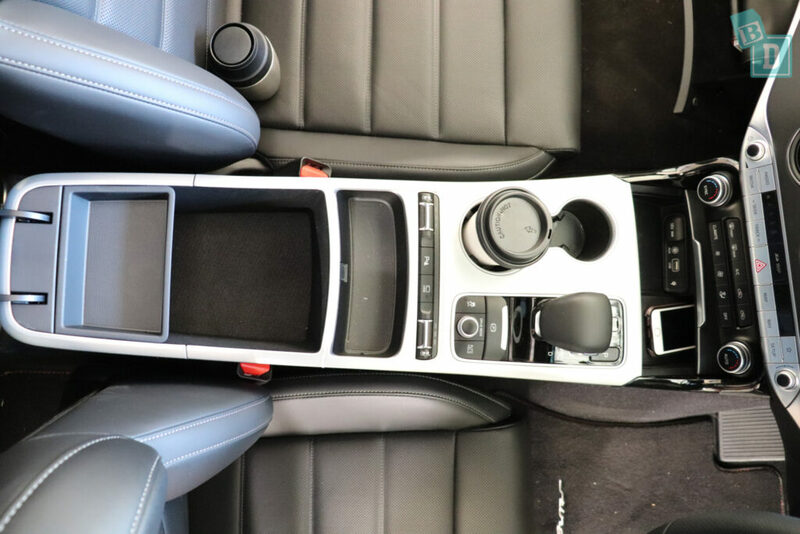 The rear headrest shape is not conducive to holding a mirror very effectively, so it falls to the side all the time and this also adds to the lack of visibility for the rear facing child. There is just one interior light in the ceiling, in the back, above the central seat. This is positioned too far back for me to reach while driving. I find it important to reach the interior rear lights so that when I am driving bub at night I can turn the lights on while she is awake so that she is not scared in the dark and then I can switch them off once she is asleep. In the front are two press on lights positioned in the ceiling by the glasses case. The stinger 330Si I drove previously had a really hard ride which disturbed my little passengers, however … the GT model has a comfort suspension option you choose using a dial which made all the difference! It was lovely and smooth to drive and you could still select sport mode when you are out on your own!! There is a handle above the back doors, which I would usually use to hang a child’s toy from. The Stinger roof is so low, cramped and claustrophobic in the back it might not be very practical! My opinion of the general aesthetics of the Stinger is that it is really great looking car on the outside! I felt let down by the interior of the 330Si model but the GT interior finishes were much more fitting with the outside of the car, like the suede ceiling, just don't get any sticky kids fingerprints on there!! 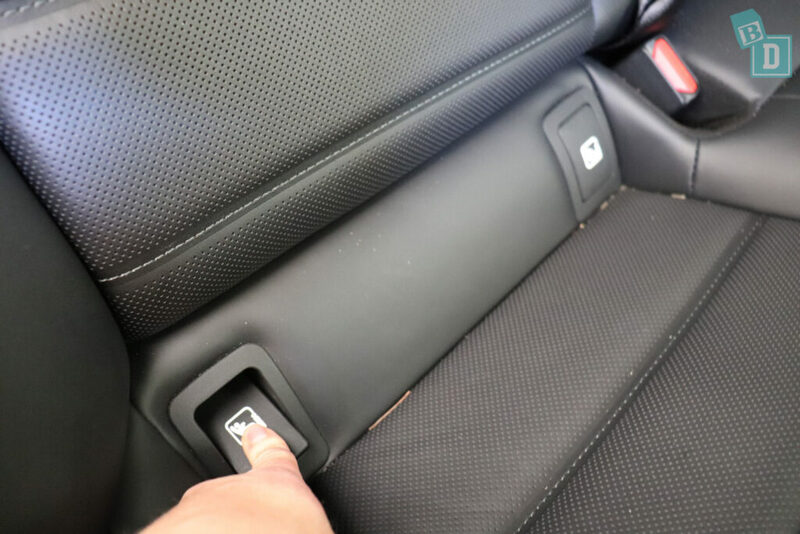 Most surfaces are all easy for wiping clean, but the seats in the front and back are perforated as if they should be cooled or heated but they are not. Being fully perforated, they are a nightmare for mums as all crumbs, sand etc will lodge itself in there. The floor mats throughout the Stinger have branded Kia labels. The tailgate in the GT is powered by just pressing the button on the key. The Kia Stiger Si, Ex, GT line, GT Sport and GT variants all got a 5-star ANCAP safety rating in 2017. Whereas the 200S and 330S variants only scored a 3-star ANCAP safety rating in 2017. In the Stinger, a warning chime and light flash up on drivers display to alert you if any seatbelt is unfastened in the front or back, which is excellent for when you are driving your family around. All models of the Stinger come with ABS brakes (Anti-lock braking system), Electronic Stability Control (ESC), Vehicle stability management (VSM) and Hill-start assist control (HAC). All help you cling to the road better and avoid losing control of the vehicle. Also alerting other drivers is an Emergency stop signal (ESS) if you have to brake hard or very suddenly. The rear parking sensors have a dash display in front of the steering wheel, which I find impractical as I have to stop mid-manoeuvre to look around the steering wheel to see the display and where it is alerting me to an obstacle. When the sensor display is on the media screen with the camera view it is much easier to look at, at the same time as the camera, meaning you are not having to look around arms, hands and steering wheels! All models come with a rearview camera with in-audio screen display and parking guidelines. The camera image is very clear and essential when reversing as visibility is so poor. The Stinger is fitted with seven airbags. In the front there is a driver side knee airbag, for driver and passenger, there are frontal airbags and front side airbags. Along the sides of the vehicle are curtain airbags to protect front and back side passengers from side impacts. The Stinger also has side impact beams. The Stinger comes with speed sensing automatic locking doors and impact sensing automatic door unlocking. There are also door and window locking controls on the driver's door panel. Its Active Hood Lift System (AHLS) makes the bonnet lift slightly to absorb and lessen the impact in the event of a collision with a pedestrian. The Si and GT models come with Driver Attention Alert (DAA), which didn’t get activated whilst I was testing the Stinger! It alerts you when your driving patterns change and your attention wavers. 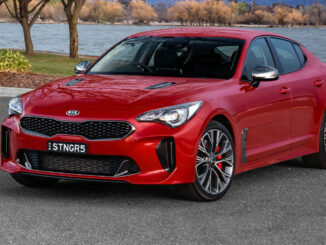 I found visibility in the Stinger shocking and there are a few features Kia have only put on the top spec GT models that would greatly help with this and I think it’s a real shame they are not on all the models. Blind spot detection (BSD) is only available on the top-spec GT models. 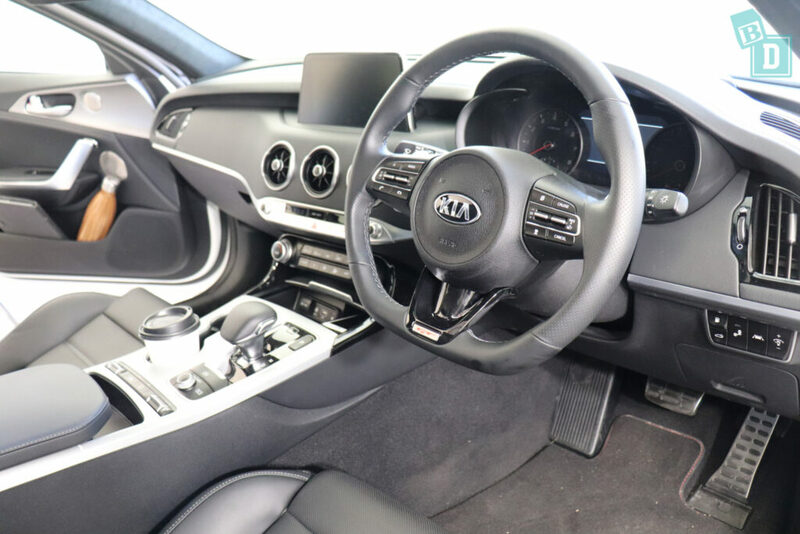 I think it is a real shame to only be on the top spec model as the visibility is so poor in the Stinger from anywhere behind the driver's headrest is basically not visible. Rear cross traffic alert (RCTA) again is only available in the top spec GT models and this is something that would really help with the lack of visibility out of the back and sides of the Stinger. The top spec GT models also come with a 360-degree bird's eye view camera. 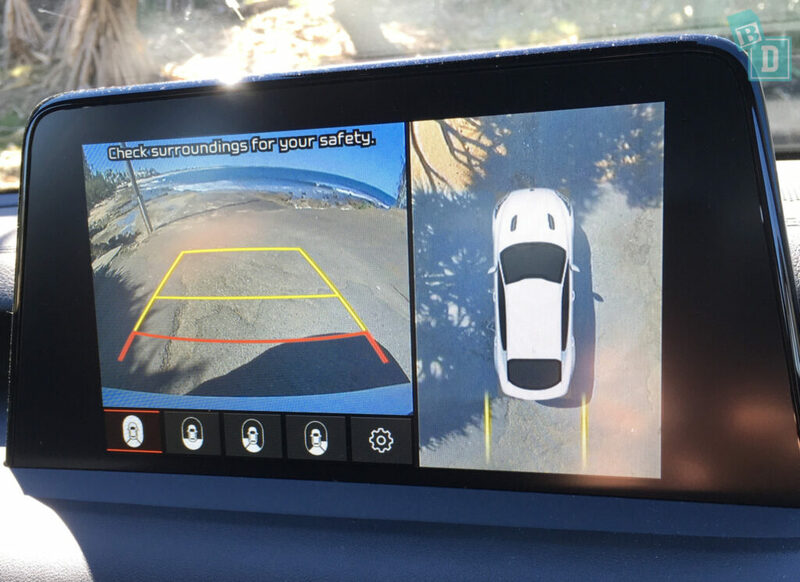 This feature would really help when manoeuvring and parking the Stinger as it is really difficult to get a sense for the extremities of the vehicle and this would make parking easier.